The outstanding characteristic of this amplifier from a technical point of view is the use of a direct coupled circuit - that is, no capacitors or coupling transformers are used between stages. I t is basically descended from the classic Loftii and White design presented for the firt time in 1929 in the well-known American magazine Radio News. This article caused a sensation not only because of the measured performance of the amplifier, which was exceptional for the times, but also because of the extreme simplicity of the design. The original Loftin-White amplifier had a frequency response extending from 50 Hz to 10 KHz at -0.5 dB without making use of any form of negative feedback, an innovation invented only a year earlier. In addition, the "comfortable" (in those days) output power of slightly more than three watts, makes the amplifier's great success easy to understand. While the design rapidly spread among hobbyists, it was also cornmercialized, ready-made or in kit form, by many companies. The original Loftin-White (Fig. 1) used a 224 tetrode (the predecessor of the 24) in the first stage and a 250 triode (the predecessor of the 50) in the output stage, achieving an elevated gain of about 50 dB foruse with phono input. Our amplifier will use all triode gain stages and it will provide an appropriate measure of gain for use with typical line level sources. We realize that presenting an amplifier based on a design developed sixty five years ago may seem strange to many of you, but to this day this circuit topology provides an unsurpassed musical performance. The popularity the Loftii-White circuit enjoys among Japanese audiophiles and experimenters is enormous, and even in France this classic circuit is highly regarded among extremist audiophiles for its great musicality. According to Jean Hiraga, one of the main popularizers of this type of amplifier in Europe in recent times, approximately 30% of homemade "audiophile" amplifiers built in Japan during the 1970s and 1980s were Loftin-White types. A monophonic version of this amplifier has been part of one of the authors' home music systems for a long time. This design was built to listen to music, not for presentation to other experimenters as a construction project. However, since the circuit is not excessively difficult, we decided to present it practically Without modification. They way we built it, the amplifier has some specialized features. Our "prototype" is constructed in such a way that it can be converted for a variety of tube combinations with a few simple changes. This feature requires specially wound power and filament transformers. Most would choose to set up the amp for particular tubes and then forget about it. There are numerous possible candidates for the output stage. We decided against using famous power triodes such as Mullard PX4, Telefunken RE604, Mazda PP3/250, Western Electric 27 SA, etc., which have valuable sound characteristics but are too difficult to find for our purposes. There are a number of more accessible tubes, including: 2A3, 6A3, 6B4G (which differ only in the voltage of the filaments and the bases), VT52, 300B, 842, 10, 10Y, 801A (the last three are succeeding versions of the same tube), 45, and 50. Of these, the first five have internal impedances of circa 700-800 ohms and work best into loads of circa 2500 ohms. The last six require higher values of primary impedance for the output transformer. In general, the construction of a high quality output transformer is less problematic as the impedance of the primary is lowered. In other words, quality being equal, an output transformer with a lower primary impedance costs less, at least among the models of the same maker. Given these considerations, we chose to go with the lower plate load tubes. 2A3 - There are two versions, a relatively rare mono-plate version and the more common bi-plate version which is actually two elements mounted in parallel in the same envelope. The mono-plate version was made by Fivre and Brimar and is characterized by a more airy sonority, rich in harmony and of great introspection. Mid and high ranges are absolutely superb, the low range is profound and well articulated. This is absolutely one of the most musical directly heated triodes. The Fivre version is the most celebrated of the two mono-plate 2A3s, having a very particular filament structure. Twelve filament sections are arranged in parallel on a rectangular frame, a design feature which some argue is responsible for its wonderful sound. By the way, the Telefunken RE604 has the same filament structure and it is the only triode we know of that's able to reach the heights of the Fivre 2A3 single plate. The bi-plate version does not reach the same summit: the inevitable difference between the two parts making up the tube renders the sound a little less limpid - the bass is slightly inflated, the introspection of the highs less developed, and the details not fully focused - in short, it is a little euphonic. However, the listening results are much better than those obtainable, for example, with a KT88, a 6550 or a EL34 mounted in pseudotriode. The bi-plate 2A3 is easy to find and it is still being produced in China. The sonic difference between the old western-made tubes and the Chinese ones is not particularly marked. Nominal output power of 3.5 watts. 6A3 - Like the 2A3 but with filament voltage of 6.3 Volts instead of 2.5 Volts. There are mono-plate versions of vintage American and contemporary Russian production. 6B4G - Like the 6A3 but with octal socket instead of 4 pin UX4. Only bi-plate. Still being made by the Chinese. 300B - The most famous of the directly heated triodes. Owes its fame to the great musicality of the Western Electric version, which is endowed with a full and richbodied sound, yet at the same time introspective and analytical. I t provides a faithful reproduction of the timbre and color of the instruments, even if not at the level of the Fivre 2A3 mono-plate. However, the 300B is superior in power, articulation, and impact of the low range. Despite its sonic glory, its excessive price (circa 1,600,000 lire per pair) leads us to look at other choices. 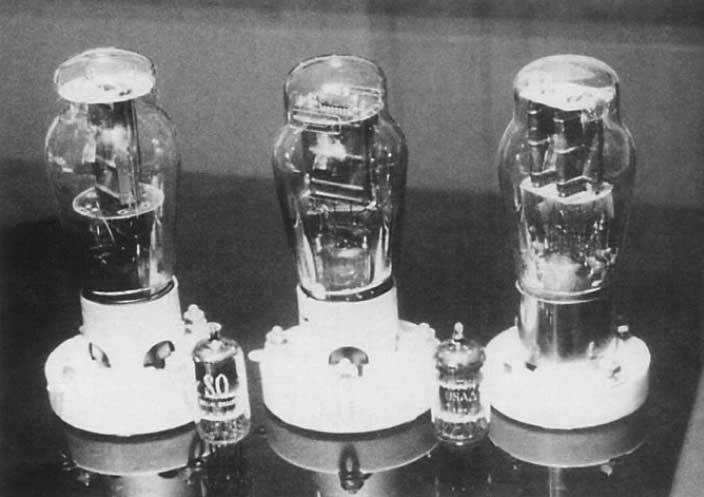 Western Electric has long since ceased production of vacuum tubes. The Cetron 300B version, while having a sonic personality similar to the Western Electric tube, is however a bit inferior in richness of harmony and introspection. The performance is nevertheless good but the price, although 40% less than the Western Electric tube, is still decidedly high. The Chinese versions of the 300B are of slightly inferior performance to the Cetron version. The price of the China 300B is a little more reasonable, but the performance is barely better than that of a 2A3 bi-plate. In our opinion, their use is justified only where an output power approaching ten watts is indispensable. 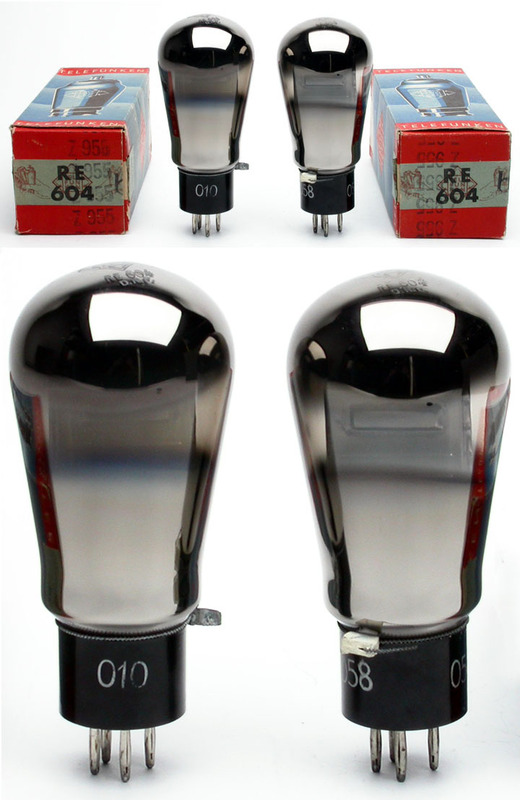 The nominal power of the 300B is 17 watts, but Western Electric recommended their use for maximum power of 11-12 Watts (per Western Electric specification #1459). VT52 (45 Special) - Enjoys an excellent reputation for its musicality. Very similar to the WE 300B in the refinement of the sound and the savoir faire with which it renders details and nuances of the musical event, but with less authority and articulation, at least in the low range. I t is somewhat difficult to find, having been out of production for decades. fed.-VT 52 is a military number. There is no exact commercial/ industrial equivalent.) Maximum nominal power of 4.5 Watts. With regard to the input stage and driver the choice is a bit easier and, for practical purposes, can be restricted to a few types: those of the 6DJ8 family - E88CC/6922 and the 12AX7 family of tubes - 5751/ E83CC/7025. We have had good results with Phiips, Telefunken and Mullard brands but no doubt there are other equally valid versions. If more gain is required as when driving the amp directly from a CD player or a low output preamplifier, try the 5751 (which has an amplification factor of 70) or, if the gain is still not enough, the E83CC (amplification factor equal to 100). All driver tubes we have mentioned are twin triodes, therefore you have the option of leaving one of the two sections unused or using both in parallel. To use both sections in parallel, reduce R4 by 10-20%. Both solutions present pros and cons. By using both sections in parallel we'll halve the internal impedance of the tube, with a consequent improvement of performance in the low range and lower sensitivity to power supply disturbances. Yet we can expect that we will also have a higher loss of definition the greater the difference between the two sections. If you want to use this amplifier in a full range application, paralleled sections might be a rewarding compromise, especially for those using the bi-plate 2A3 as final tube - which itself is made up of two triodes wired in parallel. Use carefully selected tubes whose performance between sections is almost identical. The final decision is obviously best made by listening and is left to your tastes. On the other hand, when using the amplifier for high frequencies in a multiamp system, using only a single section should give better results in nearly all cases. The circuit we present is optimized for the use of the 2A3 - or one of its equivalents driven by a E88CC. You can also use the VT-52, keeping in mind the different voltage ratings of the filaments. The main reason for this choice is the ease of obtaining 2A3s. To correctly use the other input and output tubes, it will be necessary to make some small adjustments in the power supplies. This is obviously an extremely critical component. The quality of design and constmction counts much more than a precise impedance value for the primary. We use a transformer primary of 2500 ohms but it is possible to use higher values, up to 3500 ohms. For an amplifier of this qualitative level it is necessary to find a component that is up to the task. Given the high cost and difficulty in obtaiming the best models of manufacturers like Tango, MagneQuest, and Partridge here in Italy, we are happy to report that Elettrica Brenta manufacturers good quality output, plate, and filament transformers suited to this amplifier. When constructing eq.uipment capable of attaining high peaks of musicality, the quality of the passive components assumes critical importance. This is particularly true for capacitors. Note that in the list of components, electrolytic capacitors are not recommended, not even as power supply filters. We bypassed the high value capacitors (with exception of Cl which is placed in a non-critical position) with others of small capacity in silvered mica and/or paper and oil. This practice is common among extremist experimenters who know how much the quality of these components can influence the final result. We used metalized teflon condensers made by CSI for C2, C3, and C4. The quality of these components is absolutely stratospheric, but so is the price. Also, they are problematic to fmd. Truthfully, the difference . , between these and regular condensers in polyester or paper in oil of good quality is minimal provided they are adequately bypassed by good condensers of small capacity. If you fmd yourself having sleepless nights over not finding CSI condensers, you can use teflon Siderealkaps or whatever makes you happy. We suggest that you first build the amplifier using normal carbon resistors (which have the advantage of being non inductive and sounding quite good) or, for higher dissipation, ceramic wire wound resistors. Carbon resistors are considered more musical than metal film resistors by many experimenters, but not by all. Conduct tests to verify your personal preferences. If you feel the need, you can substitute special (and costly) resistors such as Caddock, Vishay, or tantalum film resistors. If you decide to substitute the input load resistance Rl with an attenuator, remember that the quality of this component will have a determining influence on the final result. Avoid film components here. It is much better to use two-way switches to switch resistances of the right value. This way, there will always be a single resistance (and two switch contacts) on the signal path and one to ground. Needless to say, the quality of the switches should be very high. Given that a set of quality attenuators will increase final cost of the project by 10% to 30%) we suggest you use them only if it is really necessary to adjust the volume at the amplifier input. To calculate the value of the resistances in an attenuator, you can use the following equations: Rb = Rt x inv. log (-A/20) Ra = Rt-Rb Where Ra is the value of the resistance in series with the grid of Vl; Rb is the value of the resistance of entry to ground; Rt is the total resistance of the attenuator; -A is the desired attenuation expressed in decibels. A discussion similar to the one made for resistances is in order with regard to cables. To begin with, we suggest using a good OFC conductor, possibly teflon insulated to protect against inevitable encounters with the tip of the soldering iron. After auditioning the amplifier, if you feel the need to swap wire, you can substitute the initial cabling with esoteric cables in oxygen free silver or other exotic materials. We used cables of aeronautical military specifications in silver plated OFC. They cost less than "signature" cables intended for the hi-fi market and offer high quality musical performance. When you decide on the placement of the wires remember that you can utilize three dimensions and not just two as in a printed circuit. Try to achieve a tidy cable layout from the electrical point of view first, rather than from the visual: the two do not always coincide. Don't privilege apparent or "cosmetic" order to the detriment of the more important electrical order. Always remember that the ground leads must converge at one single point near the input to avoid the possibility of promoting various sources of hum. Each of the secondary transformer windings provides alternating current. The secondary of the special transformer we used has various voltage taps with a common center tap. Some builders use DC heated filaments either to eliminate hum problems or to be able to stabilize the voltage. While it is true that directly heated triodes are in fact more sensitive to brief variations in current than indirectly heated ones, we didn't find that the use of stabilized filament supplies provides significant sonic advantages - except perhaps in areas where the AC mains supply is subject to numerous and sudden jumps. We also haven't encountered any serious hum problems using AC filament supplies. The plate supply we installed has a transformer with a single secondary with several taps to allow for a choice of output voltages to meet the B+ requirements of various final tubes. The alternating current is rectified through a full wave vacuum tube rectifier. Our preference for rectifiers is the 83, a directly heated mercury vapor double diode, but nothing prohibits you from using other types of rectifiers such as GZ33, GZ34, GZ37, 5R4GY, AZ50, etc. The listening results obviously differ a little according to the rectifier tube used. The ideal filter would be made up of a two-section "pi" filter, which would result in an insignificant level of residual noise from the supply. The components in the dotted box on the schematic are for the optional second section. Even with a single section pi filter you will obtain excellent listening results. Opinions over the sonic delivery of the GZ34 are extremely varied. The wellknown journalist Jean Hiraga (editor of "La Nouvelle Revue du Son" and managing editor of "L'Audiophile"), for example, considers its sound coarse and lacking in detail; in contrast, the authoritative Joe Roberts considers this tube, at least the Mullard version, to have a resounding musicality. We must frankly say we are not enthusiastic about it and we consider all the other rectifier tubes mentioned and other similar ones decidedly superior. In any case, with so much difference in opinion the last word must await your own ears; when you have a chance do some comparative listening. A final improvement could be obtained by using dedicated rectifiers and separate filters for each stage: this would offer a lower common impedance and therefore less coupling between stages. At present, one of the authors is using this arrangement. We are not providing a schematic with this type of dual supply arrangement, but we may do so in a future issue if there is sufficient interest from our readers. Surely in this case the already considerable size of this amplifier would increase. In a directly coupled amplifier, the voltages present at the tubes are interdependent and consequently, while the tubes are heating up, the grid voltage of the output tube is wildly incorrect for a moment. The consequence is a brief period of excessively high current through the final tubes. Obviously, such abuse shortens the life of the final tube. To avoid this problem, it is necessary to delay the plate voltage until after the filaments of the tubes have reached normal operating temperature. Given that we used separate transformers to feed the filaments and for plate supply, the simplest solution is to use separate switches for the primaries of the two transformers. The filament transformer will go on first, followed by the plate transformer after an interval of thirty seconds. Another option is to employ a timed circuit, particularly recommended for the super absentminded, or for those who have small children or irremediably clumsy relatives. Adjustment of the Circuit to Various Tube Combinations The values of the components listed are adapted for use with a 2A3 or VT52 driven by an E88CC/6922. Using an E83CC or 5751 as a driver requires that the value of R5 and R6 be doubled. 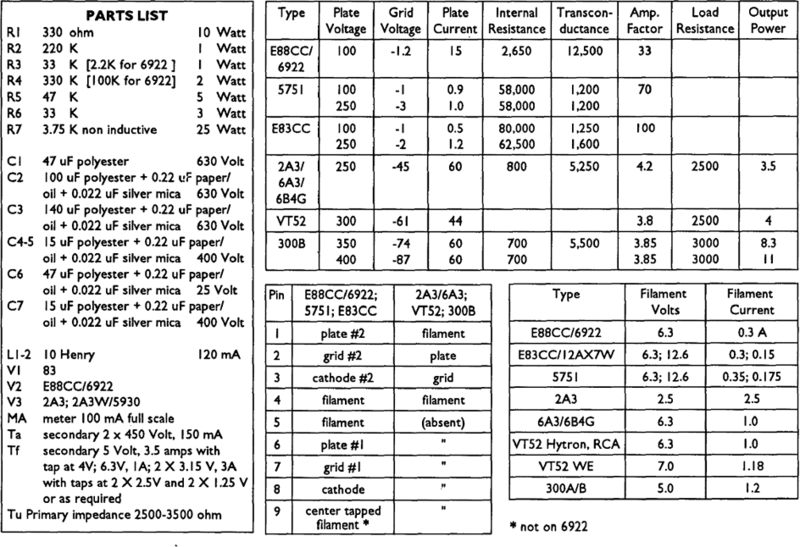 Plate voltage requirements differ according to the tube combinations used. For the final tube, a difference of cathode-anode potential no higher than 300V is recommended for the 2A3, the 6A3 and the 6B4G, and no higher than 330V for the VT52. Although the data sheet for the 2A3 suggests a maximum plate voltage of 250V in single ended use and 300V in push-pull, many hobbyists report using 300 volts on the 2A3 even in single ended use without problems of any kind and without shortening the life of the tube. The maximum plate dissipation is 15 watt for the 2A3, 6A3, 6B4G, 18 watts for the VT52 Hytron, and 15 watts for the VT52 Western Electric or Sylvania. We remind you that to calculate the dissipation of the plate just multiply the plate current by the plate voltage, i.e. the difference of potential between anode and cathode. Don't try any slyness; these values cannot be exceeded without a notable reduction in the life-span of the tubes. Naturally, source material and ~reamplification of high quality should be used with this amplifier. Given their extreme transparency, they reveal the sonorous personality of the components which are mounted in the audio chain. Obviously this is true also for recordings; we have found ourselves rediscovering recordings whose high quality we had never realized before because of the excessive zeal less gifted amplifiers subjected them to. With regard to speakers its a good idea to seek high efficiency systems, especially if you intend to use these amplifiers in full range. In a multiamplification situation, the question of limited power is obviously less relevant. The synergy between these amplifiers and the large horn systems is truly remarkable. The colorization in the mid range of speakers such as Klipschom and Altec "Voice of the Theater" seems to dilute to the point of being perfectly acceptable. Systems which are already timbrally correct acquire a transparency, musicality, and realism that is extraordinary. Truly extraordinary. We know well that listening notes written by the authors of a project can raise some skepticism, but we will seek to be as impartial as we've been when listening to amplifiers constructed by others. Besides, our long cohabitation with these amplifiers means that we really know their personality. The first version we listened to has the biplate 2A3 as final tube. We then compared it to the 2A3 single plate. We used this amplifier full range with homemade monitors using JBL components. These speakers have a 95 dB per watt efficiency at one meter and a linear frequency response 3 dB down at 25 Hz. The listening impressions are reported separately for each of the listeners. Giro Version with 2A3 biplate output tube: The midrange is airy and natural, with a good sense of presence and a remarkable musicality. The delivery of the voice is very good, lacking strain or roughness of any kind. The highs are present and pleasant but not overly detailed. Even the bass has good presence and articulation but at times one would want a bit more control. The dynamics and the microcontrast are remarkable even at low listening levels. Despite the reduced output power, considerable listening volumes are reached. Small groups are rendered with good image and detail, although there is some difficulty in distinguishing single instruments of large orchestras, especially in passages with greater dynamic impact. The musicality of harmony is maintained on a level superior to average. In biamplification service on the mid/high range, the results are better yet. When the amplifier is freed from the task of reproducing the full range, it conveys musicality and naturalness playing the large orchestras and portrays the most demanding passages of the harmonic structure with ease. Version with 2A3 monuplate: Its as if a veil were lifted and the sound stage, previously already refined and of high quality, reveals details and colors that at first were hidden to perception. The focus of the images is clear, the instruments have well delineated contrast and almost material consistency. The mid and high range are scintillatingly transparent, while the delivery of the lower parts of the spectrum is solid and responsive. Maybe the bass is not quite as controlled and defined as your better "solid state" ampliers but this unit offers articulation, a richness of timbre, a truly exceptional naturalness, not far from the fabulous low end performance of tubes like the 300B, the 845 or the 21 1. Percussion and winds are of a dazzling fidelity and naturalness. The musicians are alive and present on the stage, one feels their breath and movements. The dynamics and the microcontrast are at exceptional levels and the volume of sound is remarkable and apparently slightly greater than with the biplate version. The large orchestras are naturally reproduced, with remarkable introspection and great rendering of perspective: not only are the instruments arranged on a profound and extensive stage even beyond the speakers, the empty spaces between one instrument and the next are respected. One single caveat: the power is not always sufficient to guarantee a realistic listening level with the most imposing organs. Obviously with high efficiency speakers, such as Klipschorns, this would not be a problem. In biamplification things improve, elegantly overcoming the problems of power and those minor failings of impact and authority in the low range. The result obtained is of true realism and exceptional enjoyment. Cristiano The thing which strikes me the most in this amplifier is its extreme musicality. Hours and hours of listening, with whatever type of music, don't tire one's ears the slightest bit. The stereophonic image is extremely solid and the monoplate 2A3 abundantly extends the scene outside the speakers, reconstructing a stage that is very ample and deep. From this point of view the 2A3 biplate is a little less good. The introspective capacity is exceptional: I've discovered on some particularly "unheard of' recordings that one notices that the musicians are alive, in fact breathe, the pianist from time to time uses the pedals while the contra bassist delicately runs his fingertips over the strings. How to describe with words the emotions felt? More than once, listening with closed eyes, I opened my eyes and was disappointed to find myself not in front of the orchestra, but in front of the stereo. This is something which had never happened to me during listening sessions with notable amplifiers, such as the Audio Research Classic 60.